So inspiring! I can do that! tee heee hop prints! cuuuuuute! That is far too cute! So cute! Are you going to make a whole bowl full? I love to read your blog, even if I don't understand everything you say (I'm a french-speaking-belgian. I learned english at school a long-long-long time ago). Your little bears and puppets (?) are so cute!! Si tu comprends le français, je veux te dire que je trouve que tout ce que tu fais est ADORABLE! Et ton post sur tes enfants malades et ta maman qui vous mettait dehors en été m'a fait beaucoup rire, même si il y a quelque finesse de langage que je n'ai pas bien comprises. what a sweet wee chick!! Your big quilt is adoreable! And so are the other things you show us - really cute. Oh my gosh, hop prints?! Now those are some tiny feet! Oh you are so good at this, she is adorable. Wow, that is just too cute! she is beautiful! and very advanced for her age. I love tiny animals...my girls have a rabbit much the same scale. Too much fun! lololol @ her hop prints!!! Fabulous! She is WEENYSMALL! And I like the position of her eyes. so tiny and adorable! is it crocheted? Argh! That made me squeal! How cute! Hello sweet Elizabeth. You little darling. The bird is cute. Hop prints, clever. But honestly? Now I am dying for more stories of your mum. 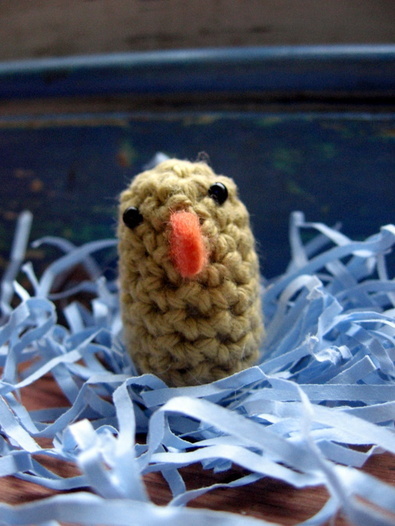 Although perhaps the combination of cute craft+clever ideas+ hilarious mum story is illegal. Simply too good to be allowed for common consumption. It made do something to us. You sure have some lovely ideas... I have finally got my blog set up thanks to your advice.. its taken a long time to work out but im there, i think! 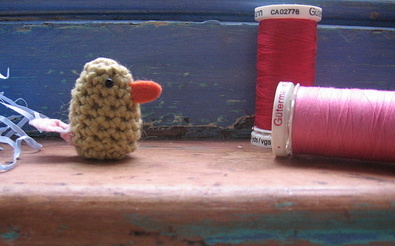 IL est mignon ce petit "poussin"
I love your blog it's such nice escapism, and your photography is wonderful. She's soo cute!! And the footsteps... what an imagination! ¡Que chulo! In English : it's so cute ! I really zould like to adopt such a bird ! Very cute - I would like to have her hanging in my keyring !